Close contact between students and their teachers has long been highly appreciated as part of teaching at CBS. Even with the introduction of blended learning, CBS will continue to be an on-campus university where students come to engage with teachers. Where online learning offers flexibility in time and space, opportunities to support diversity in students’ learning preferences as well as new opportunities in the form of activities that engage students outside the classroom, face-to-face teaching provides the social setting for discussion, questioning and collaborative analysis and reflection. Below you may find some inspiration for in-class activities - all of them suitable for both smaller and large classes. Leaning activities in class can be very rewarding for the students, if the activity is used in an appropriate way. A learning activity should be motivating for students and able to support their depth learning. 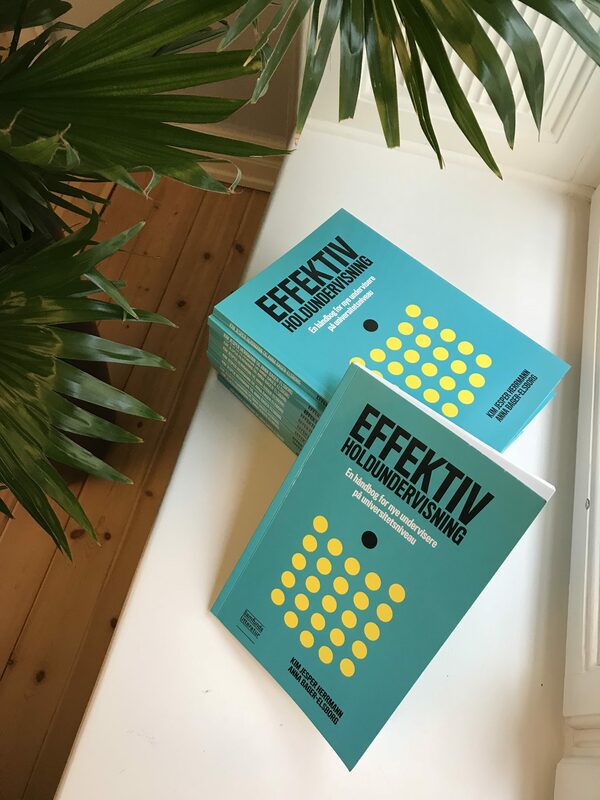 The following eleven learning activities (among others) appear in Kim Jesper Herrman and Anna Bager-Elsborgs book "Effektiv Holdundervisning - en håndbog for nye undervisere på universitetsniveau", from 2014. Feel free to stop by Teaching & Learning to borrow a copy or two. THE FOLLOWING FOUR ACTIVITIES CAN BE CARRIED OUT IN LESS THAN FIVE MINUTES. Buzz groups are based upon the students’ interaction with each other. Break the students up into groups of two or three individuals and make them shortly (1-2 minutes) discuss the answer/solution to an assignment/question. Finish the exercise by asking the students what they have discussed and support with keywords from plenary on the whiteboard. Buzz groups is a very beneficial strategy to engage the students in a quick way. The activity is not very time consuming and it is very easy to explain to the student, because it does not imply a lot of steps and instructions. When introducing buzz groups, students get the chance to speak their mind in front of less people before entering a plenary discussion. The buzz group can also be used if the students do not answer a question from the teacher. Students can be asked to discuss the question in a buzz group before presenting their response. Buzz groups are easy to manage. However, students might get tired of the activity if it is used to many times in one session. Differentiation is key. Think-pair-share is an activity consisting of three steps which lasts for about three to five minutes. The first step, think, imply that students sit by themselves and consider a question or a solution to a problem. This requires no paper, pen, computer or other device. The second step, pair, require the students to divide into pairs. Step three invites students to share with each other what they have been reflecting on in step one. To sum up, the think-pair-share enables the teacher to put together specific groups and have them share their reflections on a given subject with each other. This activity provides the opportunity for the students to reflect on a subject individually, before they have to argue or present in front of others. When students get the opportunity to share their individual reflections each other, they practice their ability to argue and justify their own point of view. The sharing of points and attitudes creates a space for disagreement and uncertainty, which is a great starting point for subsequent discussion in class. It is very important to articulate that there are no right and wrong answers during this activity. It is all about learning students reflect and justify their way of thinking. One-minute-paper is an individual exercise. In this activity the focus is on the student’s individual ability to write down thoughts, reflections or concrete facts on a specific subject. The students are asked to individually write down thoughts and associations on a specific topic or question for 1-3 minutes. The writing can also be centered around the main points in a specific theory, a specific term or a concrete method. The purpose of the exercise is that the students gain learning applying their knowledge through active writing. The written-format can also reveal how much of the curriculum the students have understood, because to write down within a short time frame, requires a specific structuring of knowledge. If the students have not understood what a given topic is about, they will experience trouble writing about it. It is important to follow up on this individual exercise in plenary. When asking students for concrete examples of what they wrote, it provides the teacher with a valuable insight into students’ level of competency in real-time. During this activity, students are asked to evaluate and elaborate on a distinction between which parts of the curriculum that is clear and what is unclear to them. Ask each student to divide a paper into two columns named “clear” and “unclear”. Students are then asked to write down texts, terms and assignments that are clear and unclear in their memory in the two columns. Wrap up the exercise by collecting some examples from the students and write them on whiteboard. Make sure that as many as possible aspects gets covered by asking if there are further difficulties that are not represented on the board. This activity gives students to opportunity to train their metacognition. The core of the activity is to make students capable of evaluating their own learning. Furthermore, the exercise makes a rather important statement: That it is not unusual that students feel some aspects of the syllabus are unclear - and - that it is the teacher’s responsibility to uncover the ambiguities that may rise. Some students may find it unnatural or uncomfortable to share what they find difficult. Make sure that the instructions are clearly defined. Finally, make sure that students who have the courage to speak about their difficulties are supported all the way through. THE FOLLOWING FOUR ACTIVITIES CAN BE CARRIED OUT in 5 TO 20 MINUTES. In a brainstorm activity, students get the chance to create a free flow of thoughts, associations and solutions. The essence of this activity is to facilitate a situation where the students can feel free to speak up their mind just after being faced with a topic. Ask the students a question or write down a word on the white board. Do not interrupt the students in the first couple of minutes. Instead take notes on the whiteboard to keep on track with the students’ opinions. This activity can be carried out as a “round”-activity. The students can either contribute with inputs or pass if they have nothing to add. It is the teacher’s responsibility to either elaborate on the keywords on the whiteboard or draw parallels between the key words that are related, if the students don’t have more to add. The brainstorm is beneficial because every student can participate. It doesn’t matter if the students’ interpretation of a term is not quite right in the beginning. During this activity the teacher must try to facilitate an environment where the students don’t feel afraid to speak their mind. 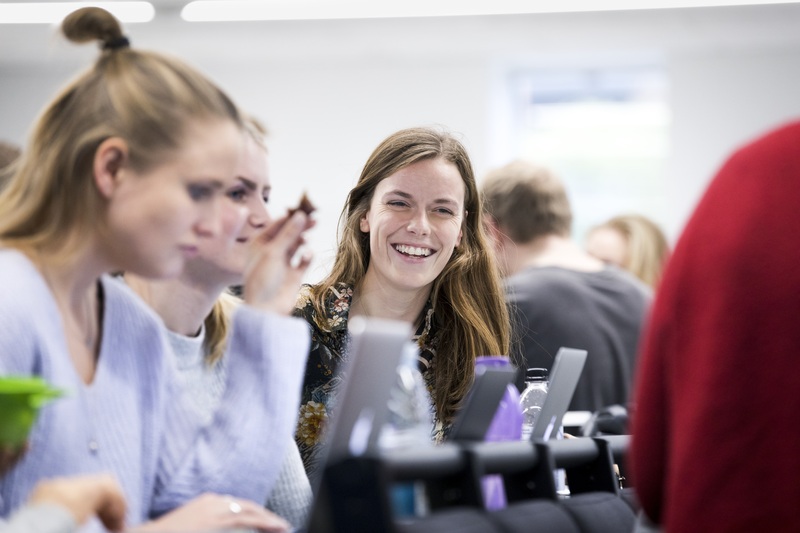 The brainstorm is an easy way to keep the students active during the lectures and it is a beneficial way to create and maintain an overview of the students’ thoughts and reflections. The brainstorm activity has an open format. Therefore, the teacher should have a to-sided awareness. First, the teacher's role is to facilitate a process which encourage students to participate and share both thoughts and assumptions. Secondly, it is yet very important in the second half of the brainstorm activity that the teacher sum up. Either by selecting some of the keywords and elaborate on these or - in collaboration with the student - find out if and how the keywords contribute to “the bigger picture”. The test is a learning activity that provides opportunity for the students to activate and get feedback on their knowledge and skills. To carry out the activity the students should be provided with either a question to answer or a task to solve. The task should typically be effectuated in the beginning of a session and typically it should be a writing. Contrary to an exam situation, the purpose of the test is not to assess or grade the students. The purpose of the test is to create an opportunity for students to receive formative feedback in order to reinforce their learning. The benefits of the test are two-sided. First, the test is able to reveal to the teacher if there are any pitfalls in the students’ knowledge there should be addressed. Secondly, the test gives students the opportunity to evaluate their own performance. In this way, the test result gives the student an indication of how he/she is able to improve in order to “stay on track”. For other students, simply knowing that they will be tested during a session will be motivating and as a result they will put bigger effort into their preparation. Some in-class tests may risk supporting surface learning strategies rather than depth learning strategies. However, the purpose of the test is not to assess what students know and remember about every single subject presented in the curriculum. Instead, the purpose of the test is to encourage students to work thoroughly with given subjects or practice certain skills a bit more. The plenary discussion is an open discussion among the students. The teacher's role is to create a space where students, equally, can participate in the discussion along with taken on the very important role as the mediator. Typically, the teacher opens up the discussion by sharing a case, statement or point of view, which students are asked to either respond to or react upon. The progress and shape of the discussion will vary depending on students’ contributions. In a plenary discussion, students are able to train their argumentation skills. Also, the plenary discussion allows students to strengthen their critical sense and yet learn how to be constructive towards other perspectives. Every student can participate in the plenary discussion allows by sharing his/her own perspective. 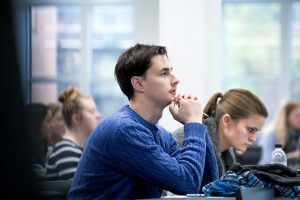 In this way, the plenary discussion has the potential to provide students with new insights and challenge their attitudes towards a given subject. A plenary discussion may risk turning into a discussion about subjects that are irrelevant to the curriculum or even it becomes a matter of personal opinion. As a mediator, the teacher must ensure that the discussion is centered around the stated topic/purpose and encourage students to keep the discussion at a professional level, e.g. asking them to reference the curriculum, use the introduced concepts and so forth. In the video above Associative Professor Rasmus Johnsen explains how plenary discussion is imperative in any kind of teaching situation. Rasmus describes three typical things a teacher should be aware of when facilitating a plenary discussion. 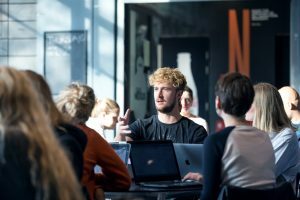 Rasmus argues that at a university like CBS where teaching is often decision-driven, and not fact-driven students can benefit in many ways from the plenary discussion. The student presentation is based upon the student own presentation of a subject and is prepared at home prior to the lecture. The student can be asked to do a presentation based upon a question asked by the teacher, a text or a case. The preparation of the presentation can be more or less instructed. Because of the work students put into their preparations, it will be those students who achieve the biggest learning outcome from the presentation. However, the listening crowd of students also benefit from the activity, simply because in some cases a student may be better at explaining a given matter to his/her peers. He/she knows what it is like to be a student and has an idea of which parts of the curriculum may be harder to learn and, therefore, deserves some extra attention. Student presentation may risk turning into small lectures. However, this format will not encourage other students to ask questions nor will they motivated to discuss. The teacher must give clear instructions to both presenter and crowd in order to create value for the entire class. THE FOLLOWING Three ACTIVITIES CAN BE CARRIED OUt in about 45 minutes. The long-term activities demand a lot more student preparation and more pedagogical preparation of the teacher. Prior to the peer-review students must prepare a short, written product and bring it to class. During the lecture students exchange their papers with each other. They must – individually - evaluate each other's writings based on a rubric provided by the teacher. To wrap up the activity the students provide each other with feedback based upon their evaluation and interpretation of their peers’ work. The peer-review is able to train students’ ability to give and receive feedback. 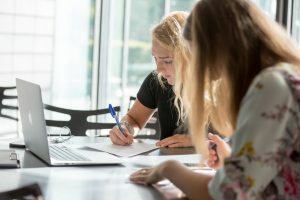 At many universities, the individual feedback given to each student is limited, and peer-reviews is a way of providing students with more feedback, without having the teacher spend an unfair amount of hours in his/her office correcting papers. The students must be well-prepared for the peer-review activity and bring their written product to class for their peers to evaluate. Also, the teacher must be willing to allocate time to create and formulate a rubric where students can read about specific evaluation criteria to make sure their feedback is aligned with the intended learning outcomes of the activity/class. This learning activity students are working in groups in at least two rounds. Before attending a session, students prepare a topic, a text or a question. During the session the students then team up with other students who has prepared the same topic, text or question like themselves. In collaboration, the students must recap the most important points, solutions or answers. Next, students team up with students that prepared another topic, text or questions than themselves. The students then present the important points, solutions and answers with their new group members. Through the matrix-group activity students are given the opportunity to express their thoughts and reflections. In the first group, students can test and correct their understanding of the work they have prepared. In the second group, students learn by being presented to their peers’ conclusions to and thoughts on a deviant question/topic. In matrix-groups activity students are working with a wider range of the curriculum, the more groups they enter. The listening group members can very quick and uncritical adapt to what is being presented by their peers, because they have not been preparing the same topic. Also, the activity requires the teacher to keep control of the logistics when students are shifting between groups. In an interview-round students interview each other. First, students are provided with a paper which has a question on it. Every paper has a color and the same question will appear on the same colored paper. To begin this exercise, let the students do the interviews mixed. A student with a red paper question must do an interview with a student who has another colored paper than red. The students interview each other and write down the answers that they have been given by their respondent. When the students have completed two-three interviews, they team up with other students the same color question and synthesize their notes from all the interviews. Afterwards the students present their must relevant points in plenary. In this activity students learn from answering questions from their peers, getting answers from their peers and trying to negotiate one final conclusions within the group of students with the same interview question. Also, students practice their presentation skills when entering the plenary discussion in the end of the activity. The interview-round may be very time consuming. Make sure to adjust the amount of questions and make them concrete and yet challenging enough to work as a foundation for a group discussion.